Submitted by Jeff Buster on Wed, 03/12/2008 - 12:05. Typical for the Dirty Dealer, they make a joke out of accounting for the public’s money on the March 11, 2008 editorial page. Just as the DD doesn’t demand accounting for the millions of dollars collected into Cuyahoga County’s general fund – purportedly for the KennedyMartConCenter - neither does the DD make any visible investigative effort to detail the cause of the huge crater in Public Square. In fact the DD purveys incorrect information about the possible cause of the massive mess in Public Square, and then letters to the editor – like Stephanie Riccobene’s on the same day - follow which pick up the misinformation and magnify it. The broken water mains didn’t fail because they are old, the cast iron mains failed because the brick sewer failed below them. 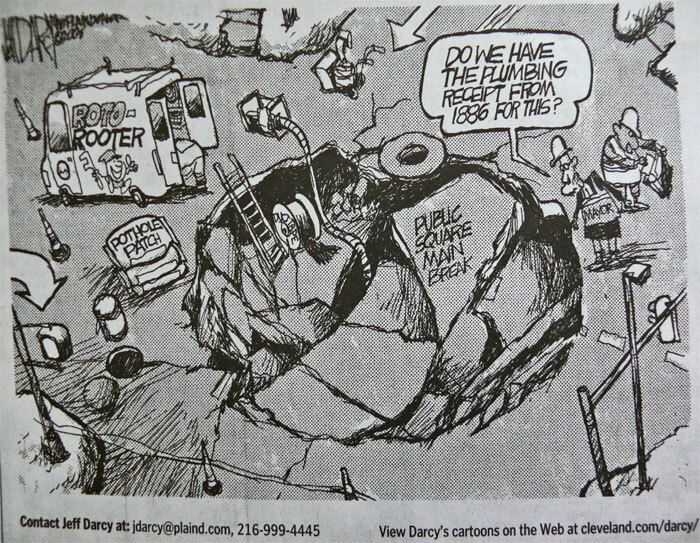 The DD appears to think the sad situation in Public Square is well suited for caricature – with a goofystupid Mayor Jackson shown hoping to recover from last century’s infrastructure installer (lower photo below). On Monday March 10, 2008 I took another photo and question/answer trip to Public Square. The two police on detail there rudely chase the public away, but Channel 19 and I got a few shots of the gapping pit from behind the plastic fencing. Following is a synopsis of more news I received from one employee who knew his stuff and gave me straight answers. In the pit are 3 water lines; a 10”, a 16”, and the 30” (which is shown broken in an earlier post here on Realneo). But I suggested in an earlier post that there had to be something else broken in the vicinity of these water mains and below them in elevation, because there was no standing water in the hole when the mains where shut off. The pit was self draining (though DD’s Darcy erroneously shows a pump with a hose leading to the bottom in his cartoon). Sure enough, there is a 4 foot high vaulted brick sewer on the north side of the pit (shown in the photo above) – running right down Ontario Street. 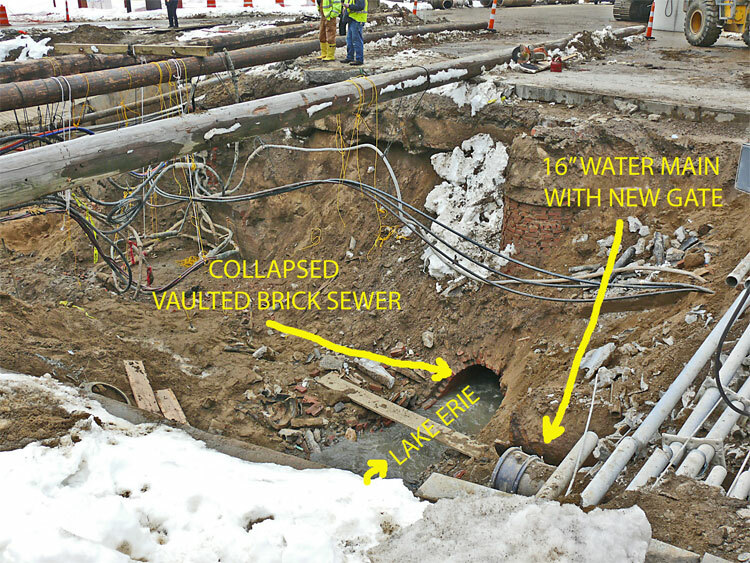 I confirmed that a section of the brick sewer was found collapsed when the repair work began last Thursday. The fact that a portion of the sewer had caved in suggests that the damage to the water mains may well have been caused by sandy soil eroding into the sewer and undermining the water mains until one of the mains deflected and broke. The old water mains are made of cast iron which won’t bend and is very brittle but will last for centuries if not physically abused. . If iron pipes are side-loaded by an imbalanced soil load, they will snap. That brings into question whether or not the brick vault sewer was inspected via cctv before and/or after the work was performed on resurfacing and installing new utilities in the street as part of the Euclid Corridor project. Was the brick sewer shown on the plans? If so, did the Euclid Corridor contracts require any protection over the vaulted sewer, or was it acceptable to drive a 50 ton Cat hydraulic excavator back and forth over the vault without putting down any matting to distribute the excavator track load? Was there any installation of new utilities over the old brick sewer? If so, who were the inspectors on the job? If the vaulted sewer wasn’t shown on the construction plans, why not? If it was shown but no protection was required, why not? Who was the engineering firm for this section of the Euclid Corridor project? Does the engineering firm, if it appears they made any oversight with regard to the vaulted brick sewer, have errors and omissions insurance? Where are the city and county law departments? Are they asking any questions? If the huge sewer main line on the West Side of the Cuyahoga river where the roadway has been collapsing let's go - the price tag for that repair will be close to a 100 million dollars - making this Public Square fiasco seem like kids play. I bet we just wait until it happens. Submitted by Susan Miller on Wed, 03/12/2008 - 13:19.
that the pipe is new? Jeff, can you explian what happened here and why the Euclid Corridor roadway is not reinforced concrete? How many more water mains or sewers will break under the new corridor? Once it is complete, will they go in to tear it up for gas lines? What's the plan here? I thought that the RTA was taking so long so that we would be sure everything under the road would be all set for years to come - I mean as long as we've got it unearthed, we may as well do what we need to do under there, right? Where's the famed fiberoptic cable? Did you see any? See any gas lines, electric cables, anything else? Did you see any Public Square rats? You know, come to think of it, they probably got hungry and ate right through that water main - that must be what happened... the rats did it. Submitted by Norm Roulet on Thu, 03/13/2008 - 01:34. There are good projections of the cost of maintaining the current infrastructure in America and it is huge and we are not doing much of what is needed so broken water lines will be the least of our concerns... just be glad we don't have any tunnels in NEO!! !